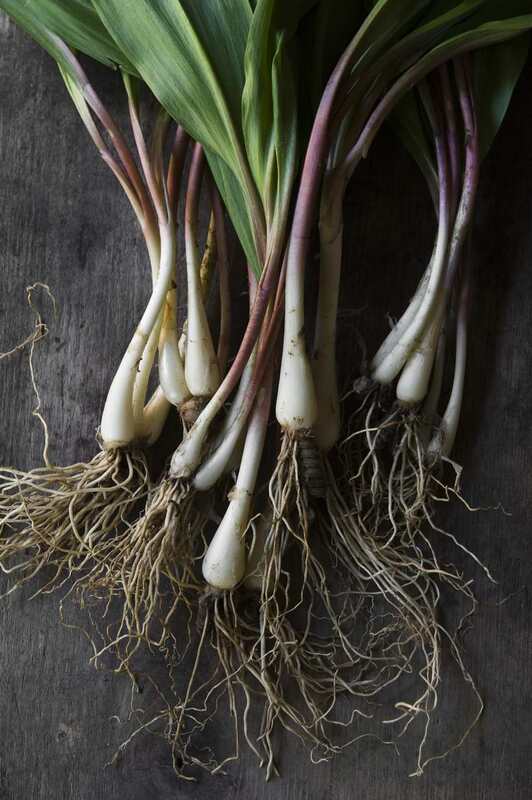 Ramps, also called wild leeks (Allium tricoccum), are only in season for a few weeks each spring. Both the scallion-like underground parts and the green leaves are tasty edibles, but they need slightly different treatments if you want to freeze them for year-round use. Ramps have been overharvested to the point of endangerment in some areas. Make sure yours come from somewhere that they are abundant, or that they have been sustainably harvested. Better yet, grow your own. Note that sustainably harvested ramps will not have any of the stringy roots at the base of the white, scallion-like bulb. But if you dug up some of your abundant backyard patch with the string base roots attached, slice them off before proceeding with the recipe. The narrow, white bulb and purple-red stems need only to be coarsely chopped before they are frozen. The green leaves, however, should be blanched before they are frozen. This blanching step helps the leaves keep an attractive bright green color rather than turning brown when they are frozen and then thawed. To blanch ramps leaves, bring a large pot of water to a boil. Add the green leaves and stir them down into the boiling water. After just 15 seconds, drain the leaves and immediately run them under cold water or plunge them into a bowl of ice water. Drain again and squeeze out as much water as possible. Coarsely chop the blanched leaves. You can freeze the underground bulbs and the stems separately from the green leaves, or together. Either way, we recommend first laying them out in a more or less single layer on a baking sheet. Freeze them this way, uncovered, for 1 to 2 hours before transferring them to freezer containers or bags (our first choice is non-plastic freezer containers). What this initial single-layer freeze does is keep the pieces of chopped ramps separate from each other once they are in the container they will be stored in. This means that when you want to use some ramps, instead of being faced with one big frozen block of them, you can take out just as much as you want. Another way to preserve ramps is to make ramps oil and then freeze that. To do so, first, blanch the leaves as above. Then puree the ramps, leaves, and bulbs, in a blender or food processor with enough extra-virgin olive oil to make a paste or sauce. Fill ice cube trays with the ramps oil. Freeze, then pop out the cubes and transfer them to freezer containers (or freezer bags). Each cube will be approximately 1 tablespoon of ramps oil. Alternatively, pour or spoon your ramps oil into freezer bags. Put in just enough to cover the surface of the bag when it is horizontal. Freeze flat (horizontal). What you'll end up with is a ramps oil "pancake" from which you can break off just what you need. You can use oil as a base for ramps pesto.